Ulmus glabra ‘Lutescens’ has a beautiful shape that evolves as it matures. It starts off vase-like and then gradually spreads to create a rounded canopy. In a sunny position, this deciduous elm tree produces vivid yellow leaves, whilst if it is in shade their colour leans towards lime green. The leaves are smooth with serrated edges and a pointed tip. It flowers in late Spring, producing pale, creamy green blooms. 'Lutescens’ is a cultivar of Ulmus glabra (Wych Elm) and is one of the finest Golden Elms due to the colour retention of its foliage. For a Golden Elm that remains upright, consider Ulmus x hollandica 'Wredei'. 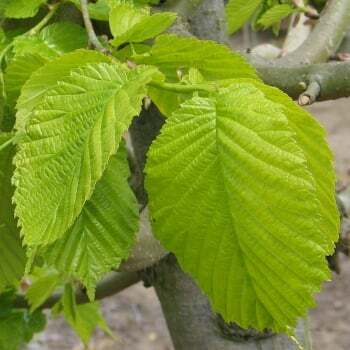 Our pot grown Golden Elm 'Lutescens' trees can be planted at any time of the year. Firstly, remove all weeds and grass within a metre of your desired planting hole. Dig a hole as deep as your root mass and approximately 2x as wide. To help your tree establish more effectively, we advise applying root grow (sprinkle in the hole for pot grown trees). When planting Golden Elm trees in spring or summer, water well and regularly for the first few months. Keep an eye on the tree and if there are extended periods of hot or dry weather, increase watering. When planting in autumn, you may only need to water a little. You can use an irrigation kit to assist in watering. Golden Elm trees do not require regular pruning. If you wish to tidy up your Elm tree, do this during the dormant season. Focus on removing any damaged, diseased or overcrowded branches. If you require a clear trunk, remove any side shoots to help raise the crown.